In an activity called the "mini drill test," NASA's Mars rover Curiosity used its drill to generate this ring of powdered rock for inspection in advance of the rover's first full drilling (Feb. 6, 2013). Image released Feb. 7, 2013. NASA's Mars rover Curiosity has drilled into the Red Planet for the first time in a major test of the 1-ton robot's ability to dig into the Martian surface and collect samples. The Curiosity rover used the drill at the tip of its robotic arm to excavate a small hole 0.8 inches (2 centimeters) deep into a Martian rock called "John Klein," mission scientists announced today (Feb. 7). The so-called "mini-drill test" marked the first time Curiosity used both the hammer and rotating action of its Mars drill. The rover pulverized the rock at its drill site, creating what appeared to be fine particles that could be used in sample-collection tests. 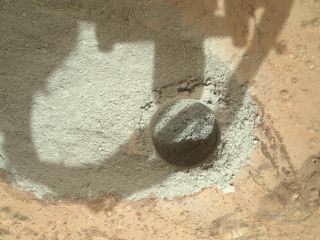 Photos of Curiosity's first drill site on Mars revealed a small, perfectly round hole surrounded by the drill cuttings. After an activity called the "mini drill test" by NASA's Mars rover Curiosity, the rover's Mars Hand Lens Imager (MAHLI) camera recorded this close-up view of the results during the 180th Martian day, or sol, of the rover's work on Mars (Feb. 6, 2013). Curiosity's science team received confirmation of the drill test on Wednesday (Feb. 6) at NASA's Jet Propulsion Laboratory (JPL) in Pasadena, Calif., which is home to the rover's mission control center. An earlier test performed over the past weekend used only the hammering, percussive action of Curiosity's drill. Mission scientists picked the John Klein rock for Curiosity's drilling tests because it appeared to hold clues into the region's watery past. "Pre-drilling observations of this rock yielded indications of one or more episodes of wet environmental conditions," mission managers explained. "The team plans to use Curiosity's laboratory instruments to analyze sample powder from inside the rock to learn more about the site's environmental history." Curiosity's drill is one of the many tools the rover is using to photograph and analyze the surface of Mars like never before. The car-size robot landed in the vast Gale Crater on Mars on Aug. 5 to begin a two-year prime mission that aims to determine if the region could have ever supported primitive microbial life. Since landing, Curiosity has already discovered evidence that the area once contained a flowing stream of water in the ancient past. The ultimate destination of the $2.5 billion Mars rover Curiosity is the base of Mount Sharp, a 3-mile (5 kilometers) peak that rises from the center of Gale Crater. Mission scientists ultimately plan to send Curiosity partway up the Martian mountain in order to better study the geology of the huge crater.